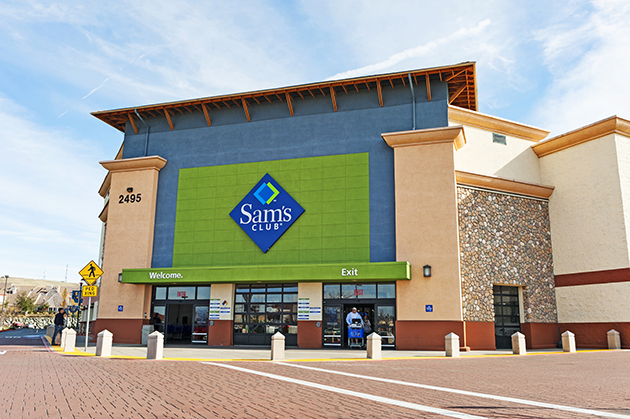 Walmart is closing 63 Sam's Clubs nationwide and turning 12 of them into distribution centers. The shifting landscape of e-commerce has been largely shaped in the last few years by a single domineering hand: Amazon's. The "A-to-Z" sales site has become the source for all things shipped, but now their largest competitor is trying to close the market share gap. Walmart, which enjoys a similar reputation offline to Amazon's online dominance, has been one of the higher-profile beneficiaries of the recently-passed tax plan. After doling out raises and bonuses, they interrupted their aggressive marketing of those acts just long enough to suddenly shutter some 63 Sam's Clubs nationwide, citing lagging performance at those locations. Not one to make hasty moves without a "next step" in play, Walmart stayed true to its savvy planning roots by simultaneously announcing that a dozen of those shuttered stores would be converted into e-commerce fulfillment centers. Considering that Walmart operates only 42 fulfillment centers nationwide — minus the newest additions — to Amazon's 140, they have a considerable amount of catching up to do, though this is an important first step. These fulfillment centers act as the grease on the supply chain, ensuring that product movement goes smoothly and has ample points at which to pivot, if necessary. When shipping speed is of the essence — and increasingly, it's a make-or-break point for online customers — these fulfillment centers open up more shipping options, enabling convenience timelines such as overnight or second-day delivery with more ease and less financial strain to the end user. With dimensional weight pricing and zones making 3PLs and traditional USPS shipping more expensive than ever, it's one of e-commerce's biggest foils. In that light, it makes a great deal of sense to get as many SKUs as close to regional customers as logistically possible, even if that means scattering fulfillment centers clear across the country. Examining the e-commerce pair's rivalry once more, it only takes a quick glance at the near-rabid courtship of Amazon for their HQ2 location to realize something important. Tax breaks are the most popular form of decision-swaying currency offered to large businesses shifting their focus. Some regions are able to offer significant tax breaks without angering existing business owners and residents. These tend to be outskirt towns that might not attract enough business to, say, keep a Sam's Club afloat. The reason Walmart is converting some of their closed warehouse store locations likely has a great deal to do with this particular phenomena: well-placed, large facility locations in tax-friendly areas — doubly so if they're in right-to-work states, a designation preferred by rival Amazon for their warehouse labor. Apart from some modifications with shelving and infrastructure, Walmart is positioned to either rapidly bring back displaced staff or hire new labor from nearby distressed towns to do the literal heavy lifting, all at budget-affordable wages. As large legacy stores like Sears, Kmart and JC Penney are struggling to find themselves — or simply to stay alive — in the new e-commerce reality, agility and evolution appear to be winning the day. While a dozen outposts won't completely turn the tide in the Walmart-vs.-Amazon battle, it's a significant logistics shot across the bow. Now that the rumors of Amazon buying Target have been mostly debunked for the time being, it's prime time — no pun intended — for Walmart to start building momentum upon this unexpected shift and start giving Amazon a more strenuous run for its money.